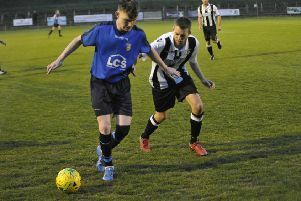 Bexhill United Football Club’s interest in this season’s knockout competitions came to an end with defeat last night (Wednesday). The Pirates were edged out 2-1 away to Mile Oak in round two of the Macron Store Southern Combination Football League Division One Challenge Cup despite taking a first half lead. It was Bexhill’s sixth defeat in seven cup matches this term and it means that the league will be the sole focus of their attention over the remaining six-and-a-half months of the campaign. Bexhill drew first blood on 21 minutes through Sam Cooper’s deflected free kick, but Oak levelled soon afterwards. Prolific marksman Danny Curd found the net from the tightest of angles following an Adam Dine free kick. Visiting manager Marc Munday hit the crossbar from the edge of the box as the score remained level at half time in a tie between two teams with 11 points from eight games in the league. Oak grabbed the winner, though, from a penalty within four minutes of the restart. Bexhill goalkeeper Yankuba Camara actually saved Dine’s initial spot-kick, but was ruled to have come off his line and a re-take was ordered, which Dine this time tucked away. The hosts went down to 10 men when Curd was shown a second yellow card. Although Bexhill hit the crossbar with a lovely effort from the edge of the box, Oak held on to set up a quarter-final trip to Oakwood or Lingfield. Bexhill: Camara, Cooper, N. Tudor, Munday, Cruikshank, J. Aston, A. Tudor, Cooper, McMinigal, Buay, Burgon. Subs: Platts, Penney.